One of the things we love about Tacoma—at any event or festival, you’re as likely to run into a booth flaunting hot-off-the-hot-shop hand-blown glass than you are to find fresh bread or the more predictable artisan fare. Glass is cultural currency here, be it glittering from display cases, dripping from ceilings in serpentine installations or tucked under the welcome mat of a local bar. Enter one of Tacoma’s most incredible yearly phenomenons—the clandestine Monkeyshines festival. Aligned with Chinese New Year and awash in moonlight and mystery, this populist hunt takes art to the people, tucking limited-edition glass baubles into the city’s most obscure nooks and crannies. It seems to be an egg hunt with streed cred. Well, it’s our first Chinese New Year in Tacoma and tragically, we weren’t able to join in the hunt. Instead, we managed to find and document the spoils of someone who did uncover a medallion, when they weren’t even looking. You find the best stuff that way. 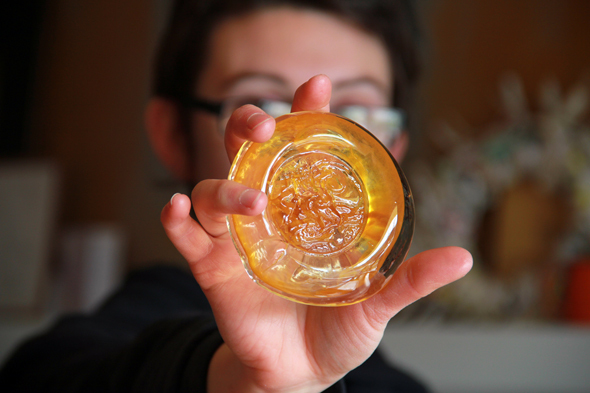 Tacoma, WA, January 23 – For the ninth year in a row, Monkeyshines, Tacoma’s anonymous glass art project, has hidden hand-blown glass balls throughout the streets and neighborhoods of Tacoma in celebration of the Chinese New Year. Now it’s up to treasure hunters to go find them. Monkeyshines first became a news item in 2003, when they gave away more than 200 glass balls in honor of the Chinese Year of the Monkey. Since then, they’ve hidden literally thousands of pieces of glass art each Chinese New Year. In 2010, more than 500 glass balls and glass medallions were hidden to celebrate the Year of the Tiger. And last year, the same happened for the Year of the Rabbit. While a few of the glass floats may actually show up on local beaches, don’t assume they’ll all be there. The artists and participants who hide the pieces try to vary the locations to keep the chance of finding one a true surprise. On previous years, the glass artworks were spotted in the branches of trees, throughout downtown, and in clever spots in many Tacoma neighborhoods. The works are meant to be gifts for whoever finds them. In conjunction with the glass art, local poster artists Beautiful Angle created a dragon-themed poster, which will also be distributed throughout downtown Tacoma. Monkeyshines is not an organization. It is a slightly-crazed art project that may or may not occur again. Keep looking in the low-growing branches of trees for more information. This entry was posted on Tuesday, January 24th, 2012 at 3:02 am. It is filed under art, previously and tagged with cult, dragon, glass, glass art, medallion, monkeyshines, photography, tacoma, video. You can follow any responses to this entry through the RSS 2.0 feed.